Since 1999 the cycling world comes to Australia for the start of the season, and so it will do this year. With the king in new colors. Until he takes the ochre jersey at least. As usual, the parcours features stages surrounding Adelaide, from flat to undulating. The stage 2 finish wasn't used for a while and is a bit uphill, but most likely it'll all come down to Montacute and Willunga Hill again. 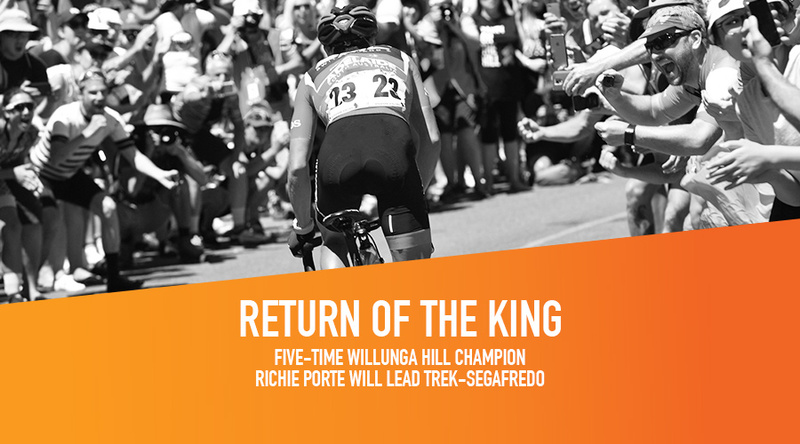 Apart from Porte, also former winners Daryl Impey, Rohan Dennis, Tom-Jelte Slagter and Luis Leon Sanchez will return to the race. Little Caleb wins the crit only rider who cares about the race. How come Sagan never ever gets involved in a crash. Everyone else does but him at some stage. Bike handling skills blah blah, but was he close to it this time? I didn't watch the clip because I know it takes me at least ten replays to even fix my eyes on the nucleus of any bunch crash. He was the right hand rider in a row of three riders near the front of the group. Going round a bend the rider on the left of those three slipped out and took the rider directly to Sagans left out. Sagan managed to get by before they would have ended up taking him out. they have shorteded stage 2 (Wednesday) as it is looking to be over 40 degrees. I couldn't figure out just what the hell any of you were talking about, as search's OP states the race as being from January 15th - 20th. Now, I realize that Australia has its own time zone, but I didn't think they were that far ahead of EST. Turns out that this crazy little race has begun already. I had no idea! OK, now I see. It's the Down Under Classic, which is, or isn't, officially part of The Tour Down Under? How come Sagan never ever gets involved in a crash. Not just a warm up crit. Sagan doesn’t crash in bike races. Bike races occasionally crash into Sagan and that ruins the races. (Wasnt he finishing TdF at half speed last year? Still brought HIS jersey home but the race was completely shambles afterwards, and some guy that never won before was able to walk away with yellow. Slight changes to the first two stages due to the conditions, not sure why they don't bring the start time forward but anyway. Ziptrak Stage 1 will now be 129 km, with the riders expected to finish in Port Adelaide at 2.24 pm. Novatech Stage 2 will now be 122.1 km, with the riders expected to finish in Angaston at 2.22 pm. Perfect finish for Harley, scary how good he was those early months of 2011. Looks to me as if Viviani was closing the door a teeny bit on Walscheid at the end. He'd still have won without that maneuvre, but it seems he wanted to make sure. Looking at the overhead shot, he definitely starts going left before his rear wheel is clear of Walscheid's front wheel. This is what happens in sprints, though, and Viviani was way clear at the line. Increasingly looking like Kuba will score 18 times as many points as Sagan this season. I think he looks clear there. It's a bit deceptive at first look because the shadow of his rear wheel is trailing him the whole way. The wheel itself, however, appears to be positioned more safely. I'd bet that if there was a side camera angle it would be more evident. But that is one, insane acceleration. It looked like a man against boys. I can't believe how far back he was. But I still don't understand why we never get to see the overhead angle in real time. The worst place to assess a mass sprint from is that typical head-on perspective. There's no depth perception for the viewer, and it's usually impossible to see the actual space between riders. You're right about that. Damn shadows! I just watched, or rather endured the full stage coverage from Ziggo Sports, recorded last night. Kind of them to let Liggett and McEwen's commentary go out live, instead of their Dutch commentators. What a strange stage. Breakaway reeled in 40 plus kms from the finish, then it becomes a training jaunt for the next hour, before the usual 5km charge for the line. There was a headwind and McEwen had warned of the dangers of opening up too early. Viviani's finishing speed looked kms faster than anybody else. By the way, it was a great race watching, much better than the vuelta stage and Jasper Philipsen should graduate to WT ( or ?) someday soon...great classics riding with smooth tactics where the norwegians and danes were shooting each other down for 50 km , Philpsen just waited for the decisive moves and followed. Less good commentary by Liggett: "Impey going for it, Impey in the lead, Impey ... this looks like Luis Leon Sanchez"
I still prefer the less good commentary option to the Ziggo's Dutch duo. At one point during today's commentary, McEwen and Jens Voigt managed to exclude the old codger completely for about 5 minutes. Anyhow 2 stages done and my conclusion, so far on the TDU: The only race to have a 5kms neutralized start and a 50km neutralized finish. It's not Marc de Maar doing the comms for Ziggo is it? Think he was doing some for them last year. That first tweet sums up the stage. A lap and a half of racing just not enough to be very selective. The Corkscrew stage today saw more of the same, but this time without Sagan. Woods, Porte, Bennett and Poels had a bit of a gap on the climb but were brought back early.